More than a physical state, your wellbeing is also a state of mind. At InterContinental® Abu Dhabi, we have the facilities to help you on both fronts. Late-night workout, impromptu tennis match or a lazy afternoon on the beach – it’s all about balance. 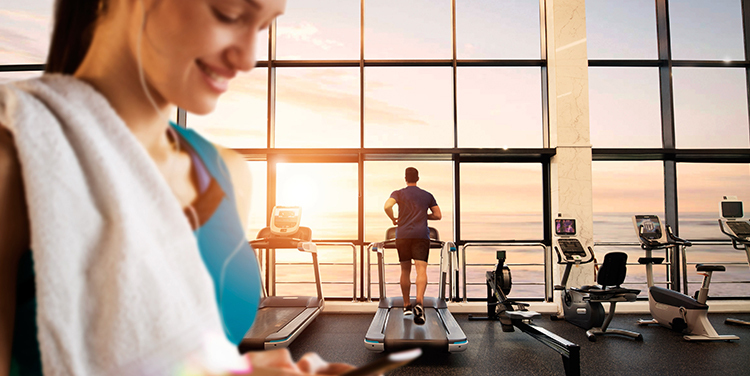 Whether you’re here on business and looking to maintain your fitness routine or you've brought the family for a weekend away, you’ll find facilities to suit your lifestyle. At InterContinental Abu Dhabi, we provide you with a variety of ways to engage in productive uptime – but not at the expense of your rejuvenating downtime. On the contrary, we've done our best to help you make time for both. Our Wellness Club centres on a modern, fully equipped gym that’s open around the clock, while the Bayshore Beach Club is all about cooling off, stretching out and slowing down. AN URBAN HAVEN OF WELLNESS AND RESTORATION. - A large open-air pool with swim-up bar and sun loungers. - Shallow children's play zone. - A dedicated kids' club for children from 3 to 14 years of age. - A large gym with personal trainers. - Treatment rooms with experienced therapists offering Elemis facials and massages from around the world. - Jacuzzi, plunge pool, steam room and sauna – with changing and shower facilities. - Two floodlit outdoor tennis courts with tuition available. - Sports fitness body classes for stress reduction. An urban oasis of tranquillity overlooking the Arabian Gulf. Located at the heart of Abu Dhabi, Bayshore Beach Club is an urban oasis of calm with secluded private beach, mature tropical gardens and a selection of pools for visitors of all ages. Offering delectable dining, relaxing treatment and all kinds of fun activities, we have something for every kind of traveller. - Infinity pool with swim-up bar. - Bayshore restaurant, offering a wide range of snacks, salads and meals as well as cocktails and drinks. You may also enjoy your meal at your sun lounger or poolside day-bed. - Fully equipped gym and wellness treatment rooms with fully trained wellness specialists. - Beach volleyball, paddle boarding, kayaking and more. - Children’s play area, splash pool and toddlers' pool. - Motorized and non-motorized water sports. - Membership referral: Refer a friend to enroll for 1 Year membership and get 1 month free in addition to existing membership. Scheme applies to NEW Annual membership enrollment only. Our signature children's club offers a collection of family-friendly services that help take the stress out of travel, making the entire experience feel just a bit more enjoyable for you and the family. We promise your child a diverse range of exciting experiences. Access the Children's Club is free of charge.